View More In Optical Drives. 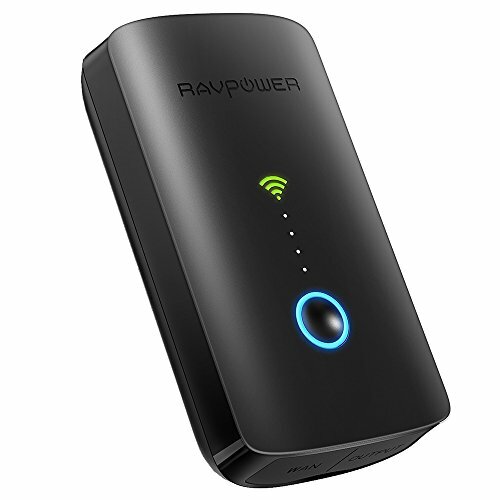 RAVPower RP-WD03 FileHub is NEW upgraded Filehub Plus, 6000 mAh power bank, portable travel router, SD card USB reader and a media streamer. 1) Supporting to reading USB hard drives up to 4TB and SD/SDHC/SDXC cards up to 256GB. 2) Perfect for when you need to free up space for Android or iOS devices. 3) Up to 5 mobile devices can connect simultaneously allowing you to stream media from the SD or USB drives, or you can directly share files between two different storage devices. 4) As a portable router, you can turn any wired network and make it wireless, or connect it via a DSL or cable modem and it will act as a regular router. 5) Act as WiFi extender, If you connect it to an existing Wi-Fi network, you can share hotspot access with all your friends and families - perfect for hotels or places you each need to pay for internet access. 1) Due to the limitation of the Apple iOS system, you can ONLY access the Photos folder on your iPad/iPhone; Filehub is currently unable to sync with media files stored in iTunes to USB storage devices due to digital rights management (DRM). 2) Does not work with Mac formatted hard drive. If you have any questions about this product by RAVPower, contact us by completing and submitting the form below. If you are looking for a specif part number, please include it with your message.